When was the last time you had lunch and you felt like a million bucks afterward? Most times we are shoving in carbs, drinking a cup of coffee loaded with sugar and cream, maybe a candy bar from the vending machine. The side effects of eating like that kicks our thyroid out of wake, we are tired, moody, most times we are looking for a nap and you can watch the weight creep on. This beautiful Nori wrap is a life saver, really it is, it boosts your immunity, balances blood sugars, heart health, loaded with protein, has tons of minerals and vitamins A,B,C & K , reduces your blood pressure, digestion, anti-inflammatory, calcium, magnesium, bone health, improves your memory, Cancer fighting, Immunity,prevents degenerative disease, youthful skin, eyes, weight loss, Thyroid health and my favorite Boosts those feel good chemicals in your brain!! Yay an instant happy pill in real food form. I can tell you that my family loves that part. This Nori Roll not only looks beautiful when prepared with all those colors and flavors it makes us look beautiful inside out. Let me give you the recipe so you too can enjoy this dish. 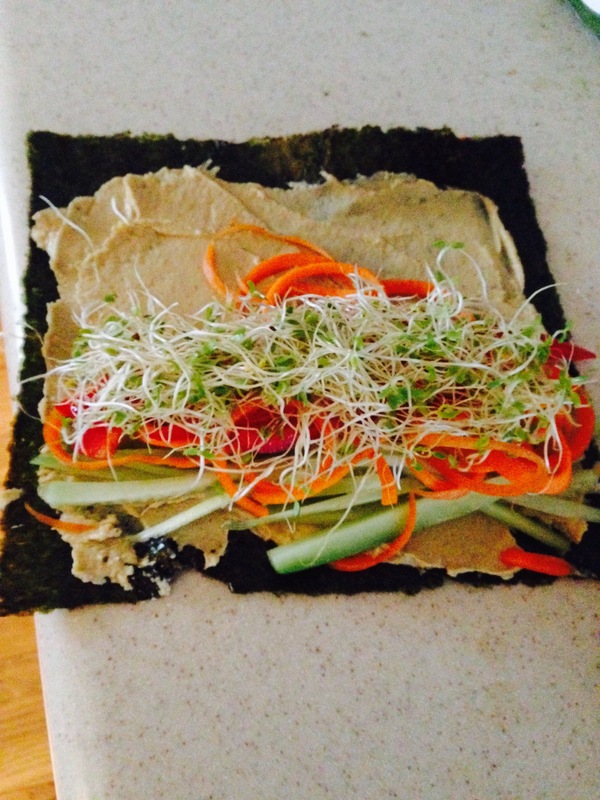 Spread the Hummus on the Nori sheet, layer the veggies as you like roll it up. I add some hot sauce to mine, you can add quinoa, olives, roasted peppers the sky is the limit. 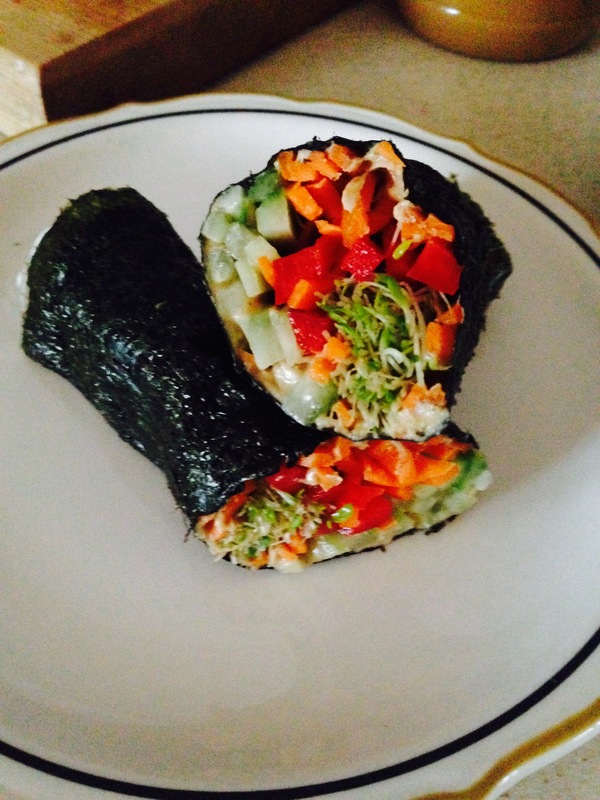 If you don’t like the Seaweed you can use your favorite Gluten free wrap.